Autumn sees the arrival of so many wonderful fruits, one of them being figs. this is a fantastically versatile fruit and is truly delicious when paired with smoked duck. We recommend serving this sumptuous salad with a glass of the Sicilian Adelante Red with its fruity notes and peppery finish. Remove excess duck fat by laying the knife flat between the skin and meat and running it down the breast. Cut the fat into strips and set aside. Cut the duck into thin slices across the breast. Slice the spring onions and put them into a large bowl with the watercress. Quarter the apple, remove the core and slice thinly. Add the pieces to the salad. Cut the figs into quarters and leave to one side. Warm a pan under a high heat, add the duck fat and fry until crispy. Remove strips and drain on to greaseproof paper. Whisk the oil, mustard and vinegar until emulsified to a vinaigrette. 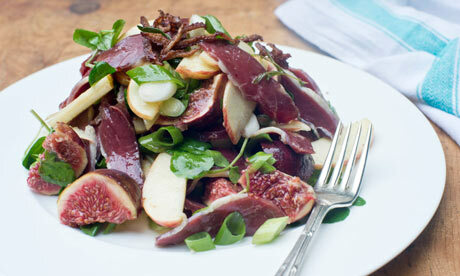 Add the duck and figs to the salad and dress. Add salt and pepper to taste and toss together. Finish with the crispy fat on top and serve with crusty bread. ← Sicilian Wines on offer!